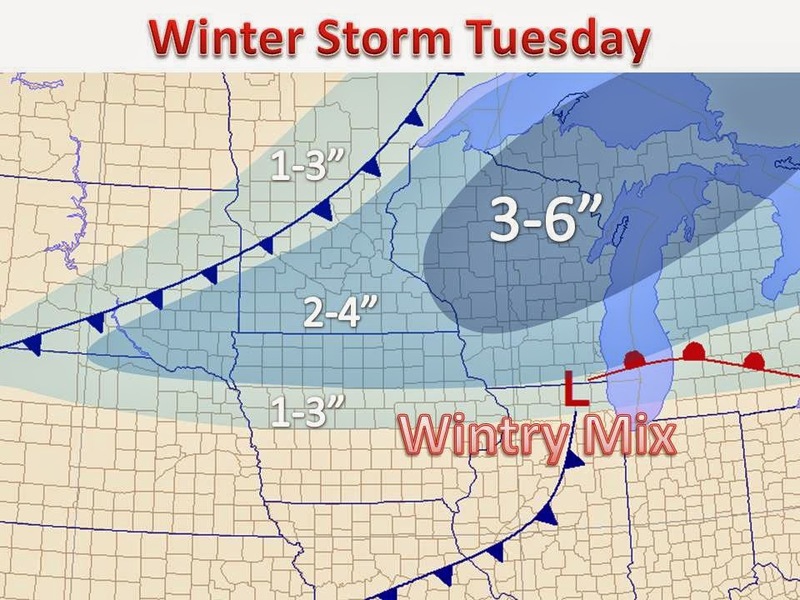 Yet another winter storm will impact the Midwest. This time around areas further to the north will get in on the action. A storm will develop on Monday over eastern Colorado and track east, northeast Monday night. Southerly winds ahead of the system will usher in warm and moist air along the Mississippi River. The moisture will wrap around the center of the storm Tuesday and drop several inches in the cold sector of the system by Wednesday morning. Our forecasted snow totals are mapped out for you. A general 2-5" of snow can be expected from northern Iowa to Canada. Areas further south will be limited in snow totals, as a warmer layer above the surface will change much of the snow to sleet, freezing rain and just plain old rain. Thunderstorms and even some severe weather is possible points further south. No matter where you are, cold air will once again filter in behind the system as Wednesday and Thursday get closer. Things look to warm up significantly Friday and Saturday, before a possible pattern change next week that could bring above normal temperatures to the Midwest. A welcomed sight for many!